Oulu is a city and municipality of inhabitants in the region of Northern Ostrobothnia, Finland. Popular historic sites such as Kauppahalli and Holy Trinity Orthodox Cathedral are in your itinerary. 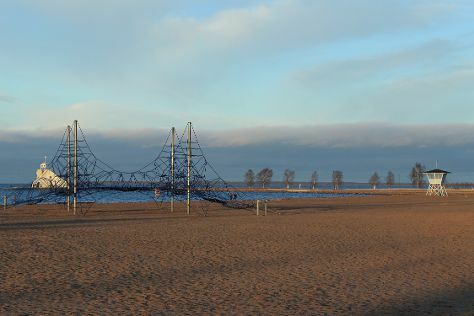 Escape the urban bustle at Nallikari Beach and Hupisaaret Park. Step out of Oulu with an excursion to Kierikki Stone Age Centre in Yli-Ii--about 54 minutes away. There's lots more to do: admire the striking features of Oulu Cathedral, test your team's savvy at popular escape rooms, see the interesting displays at Turkansaaren Ulkomuseo, and shop like a local with Pohjoisen Valokuvakeskus. To find more things to do, ratings, where to stay, and other tourist information, you can read our Oulu travel itinerary planner . Tel Aviv, Israel to Oulu is an approximately 11.5-hour flight. Prepare for colder weather when traveling from Tel Aviv in April: high temperatures in Oulu hover around 5°C and lows are around -3°C. Wrap up your sightseeing on the 20th (Sat) to allow time to take a bus to Kuusamo. Kuusamo is a town and municipality in Finland. Get outdoors at Kiutakongas Rapids and Karhunkierros. There's lots more to do: take an exotic tour of a safari tour, look for all kinds of wild species at The Predator Center in Kuusamo, admire the masterpieces at Hannu Hautala Nature Photography Centre, and experience rural life at Palosaari Reindeer and Fishing Farm. To find reviews, traveler tips, more things to do, and more tourist information, you can read our Kuusamo trip planning site . Getting from Oulu to Kuusamo by bus takes about 3 hours. Other options: drive; or fly. Traveling from Oulu in April, you can expect nighttime temperatures to be little chillier in Kuusamo, with lows of -6°C. On the 24th (Wed), you're off tohome.